Μετά τις leaked φωτογραφίες, σήμερα παρουσιάστηκε το Audi A3 sedan concept. Το πρωτότυπο δείχνει πως θα μοιάζει η επόμενη γενιά του A3 και διαθέτει επιθετική σχεδίαση, LED φωτιστικά σώματα και ένα κοφτό πίσω μέρος. Οι διαστάσεις του είναι παρόμοιες με το A4 B5 του 1994 και ανέρχονται στα 4 μέτρα μήκος, 1.84 μέτρα πλάτος και 1.39 μέτρα ύψος και ζυγίζει 1540 κιλά. Μηχανικά θα φορά τον πεντακύλινδρο 2.5 λίτρων TFSI κινητήρα απόδοσης 408 ίππων ο οποίος θα συνδυάζεται με το 7-τάχυτο αυτόματο κιβώτιο S tronic με την κίνηση να μεταφέρεται σε όλους τους τροχούς χάρη στο σύστημα τετρακίνησης Quattro. Τα 0-100 χλμ/ώρα τα κάνει σε 4.1 δευτερόλεπτα. 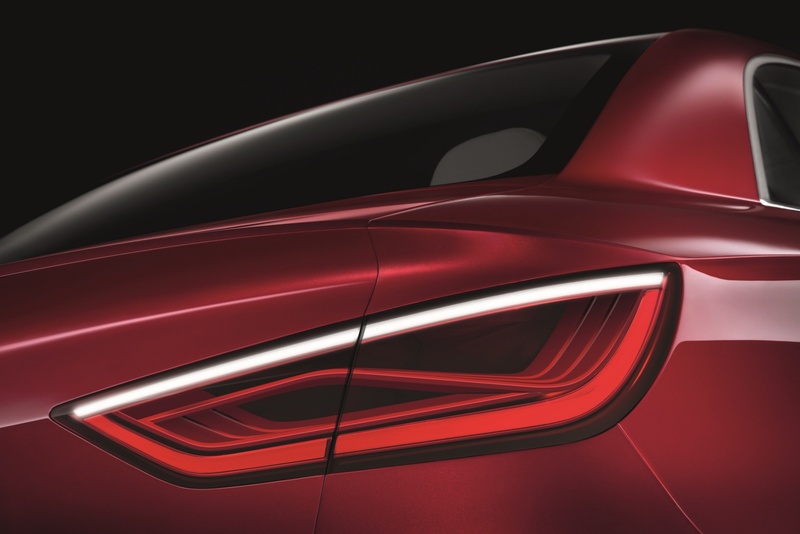 Audi is set to unveil an attractive technical study – the A3 concept – at the Geneva Motor Show. 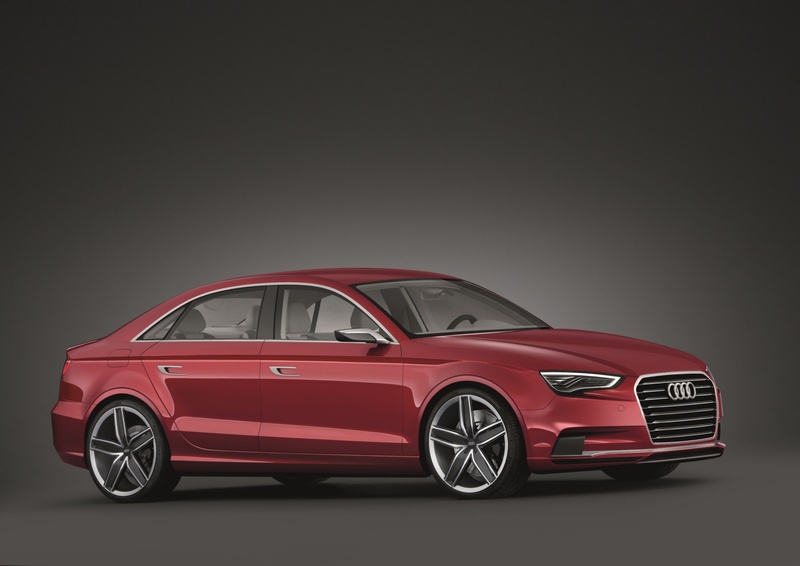 The four-seat notchback sedan integrates the full breadth of the brand’s technological expertise – from the improved MMI operating system, to the high-tech infotainment system, to the drivetrain. 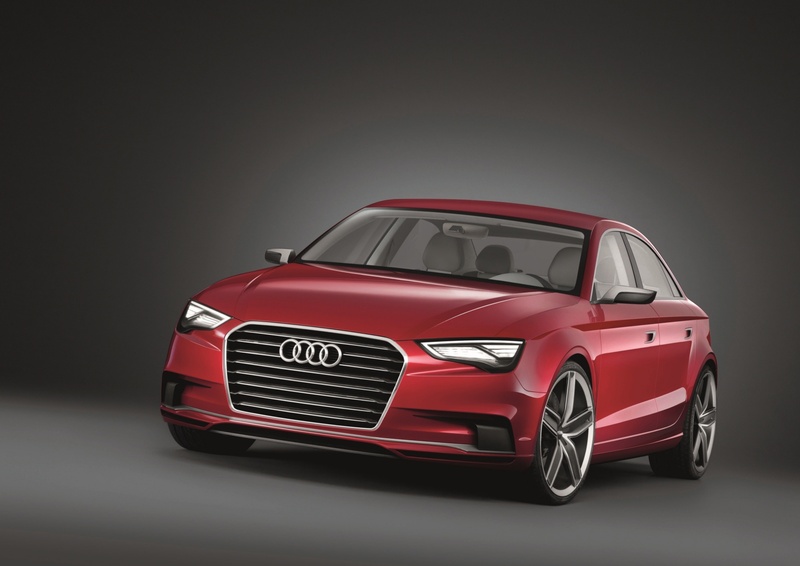 A five-cylinder turbo developing 300 kW (408 hp), a seven-speed S tronic and quattro permanent all-wheel drive ensure thrilling dynamics along with high fuel efficiency. 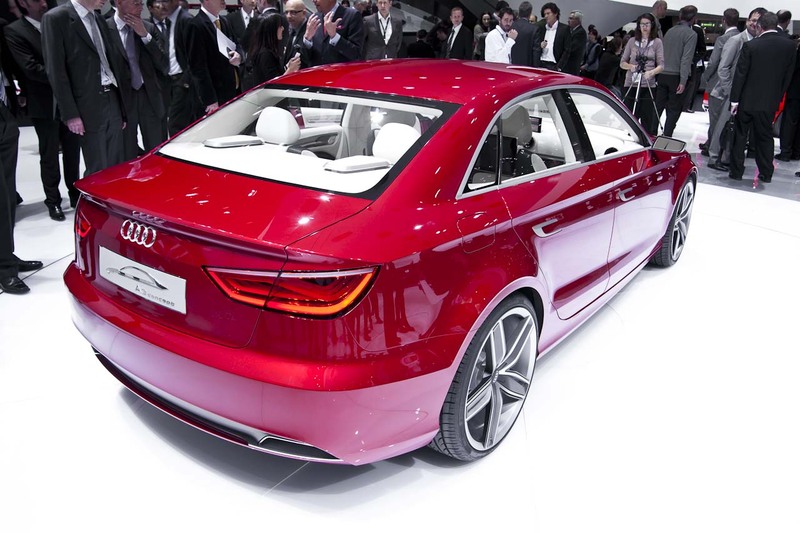 Design and body The Audi A3 concept is a four-seat notchback sedan. It measures 4.44 meters (14.57 ft) long and 1.84 meters (6.04 ft) wide, but just 1.39 meters (4.56 ft) high – proportions that underscore its dynamic character. 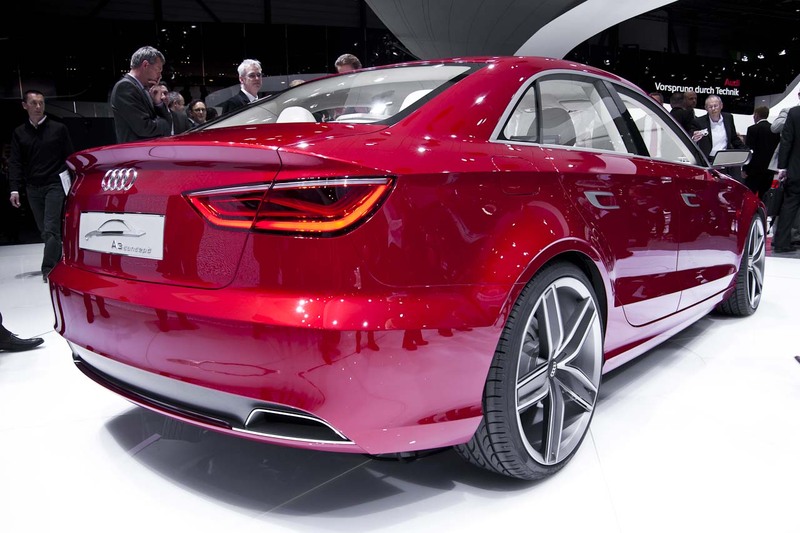 The design represents the typical Audi language of sporty elegance. 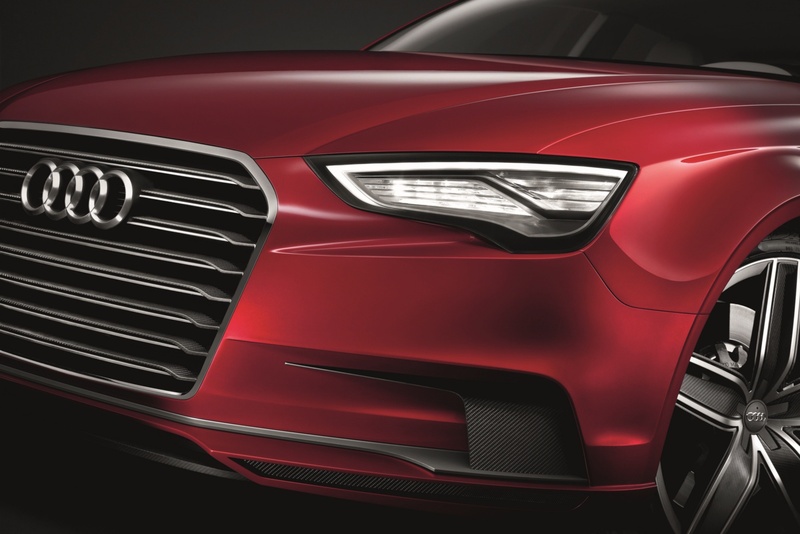 The single-frame grille is integrated into the front end, giving it a sculptured look. 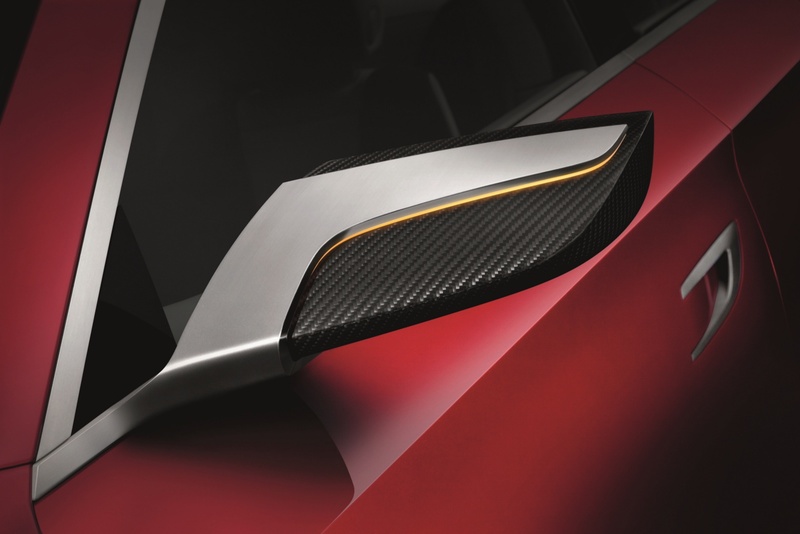 Its frame is made of carbon-fiber-reinforced plastic (CFRP), and the transversely mounted, three-dimensional aluminum louvers create a visual effect that emphasizes the showcar’s width. 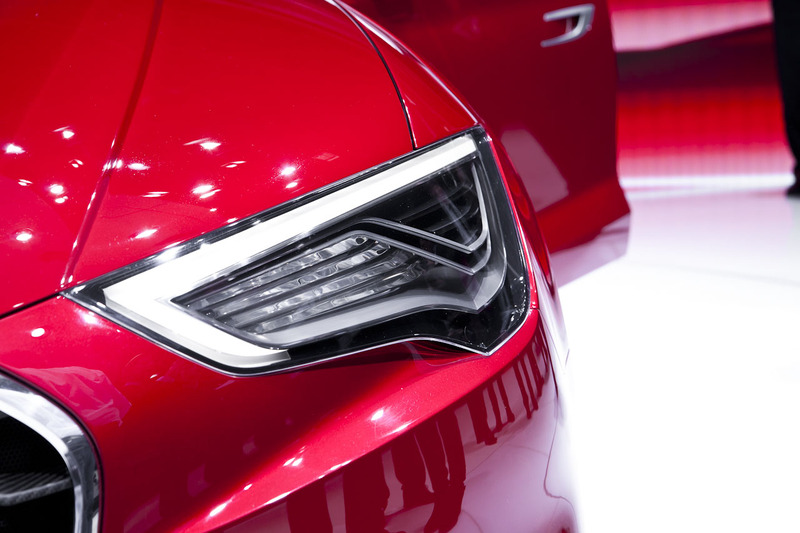 The headlights merge with the beveled upper corners of the single-frame, forming a transition that marks the starting point of the prominently accentuated lines of the engine hood. 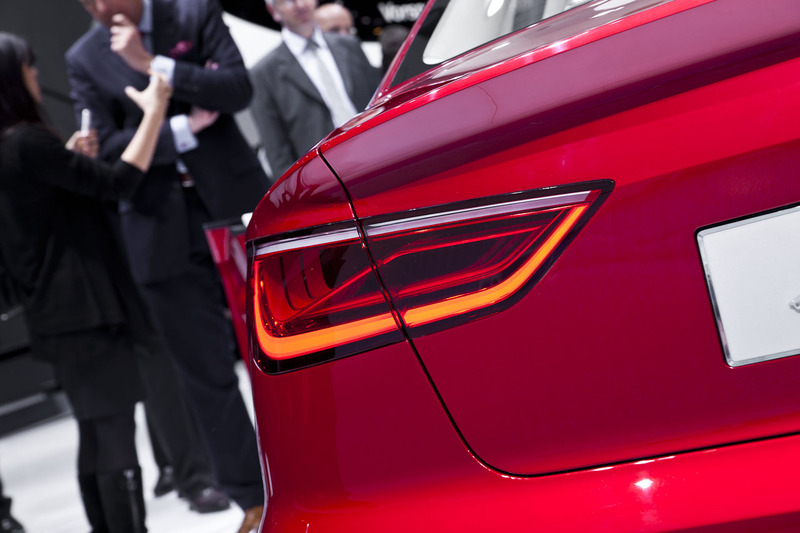 The headlights represent a new stage of evolution in LED technology, a groundbreaking innovation from Audi. They become broader as they extend outward, and a line underneath them makes them seem to float on air. Above the front spoiler is a full-length air intake, also made of CFRP, framed by a metal clasp. 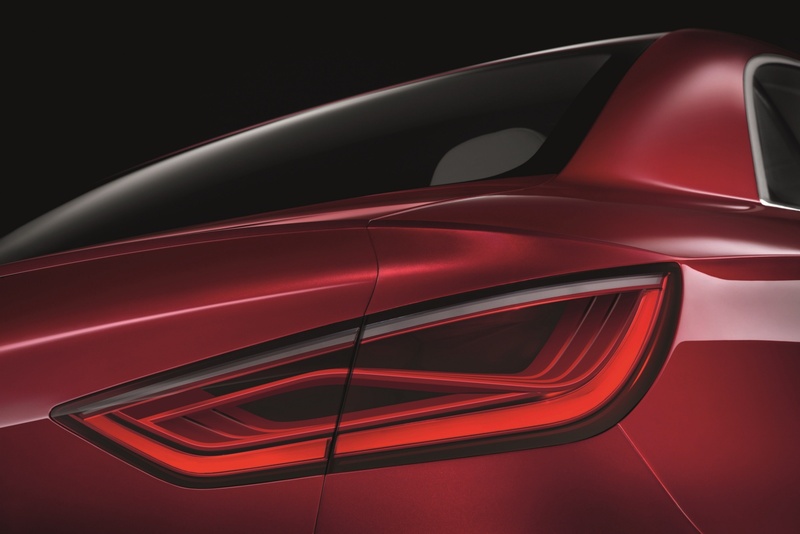 The spoiler features a splitter that raises the downforce on the front wheels. 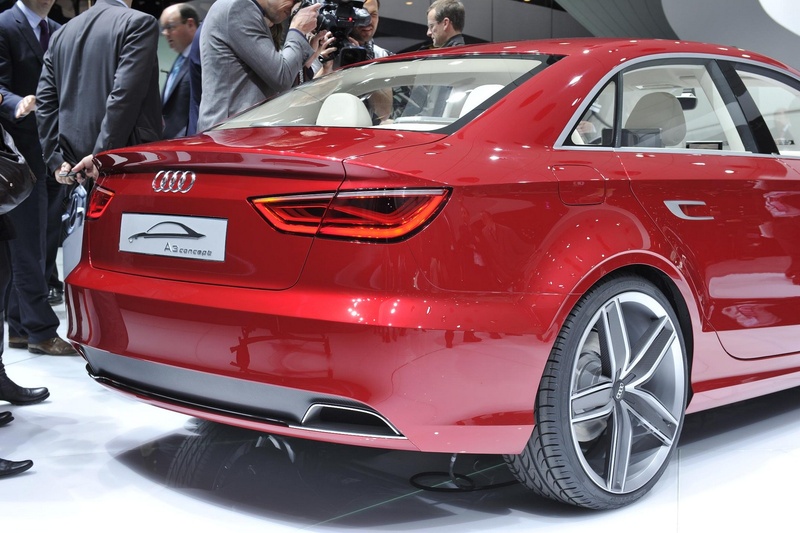 When viewed from the side, too, the A3 concept is recognizable at first sight as an Audi. 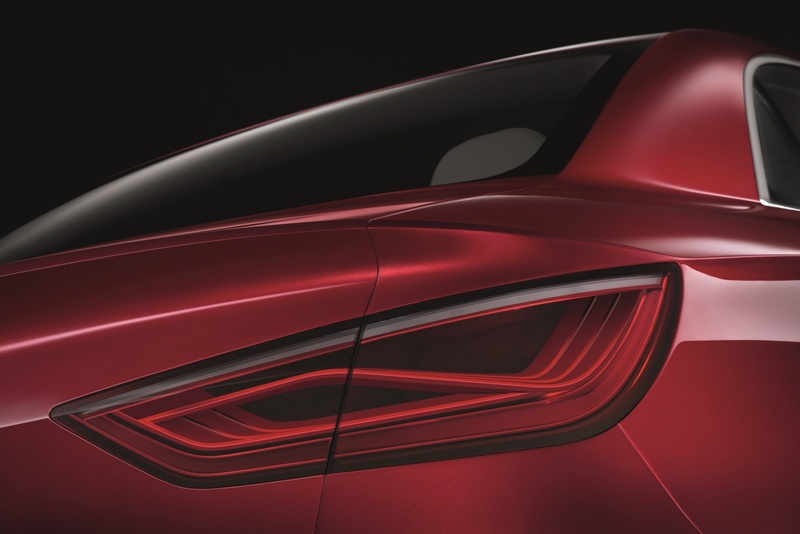 Harmonious proportions, taut, muscular surfaces and a low roof dome with fluid lines flowing into a flat, coupé-like C-pillar. 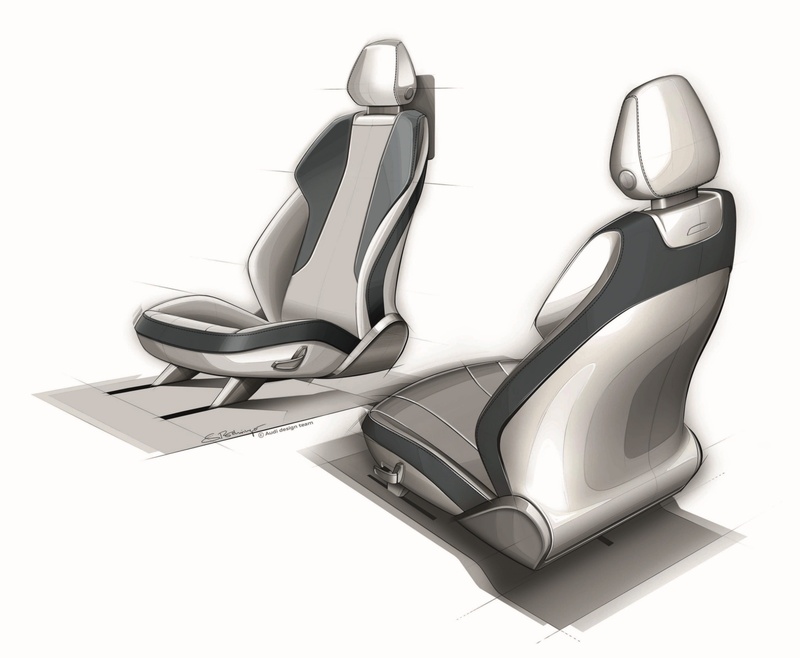 The shoulder area transitions elegantly into the tailgate. 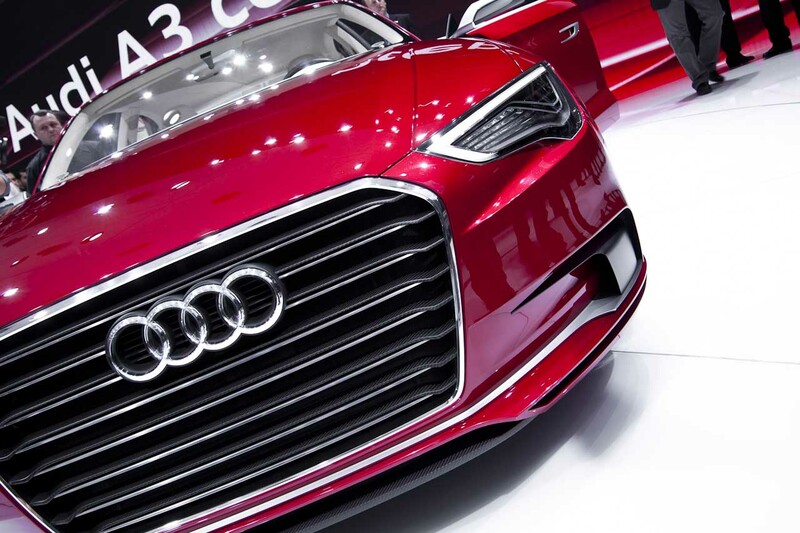 Characteristic of Audi design, the greenhouse accounts for one-third of the height, while the sheet metal makes up the remaining two-thirds. 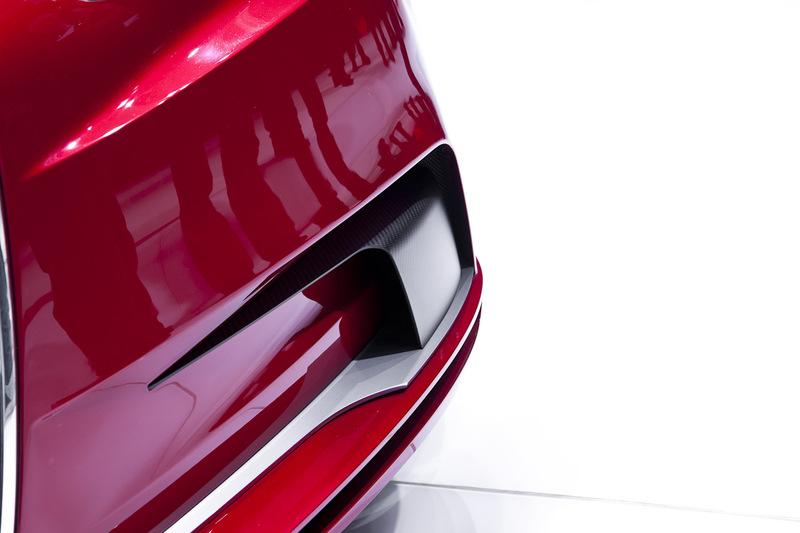 Powerfully flared fenders hint at the power of the engine. Two prominently elaborated lines accentuate the flank: the undercut tornado line beneath the window edge and the dynamic line above the sills. 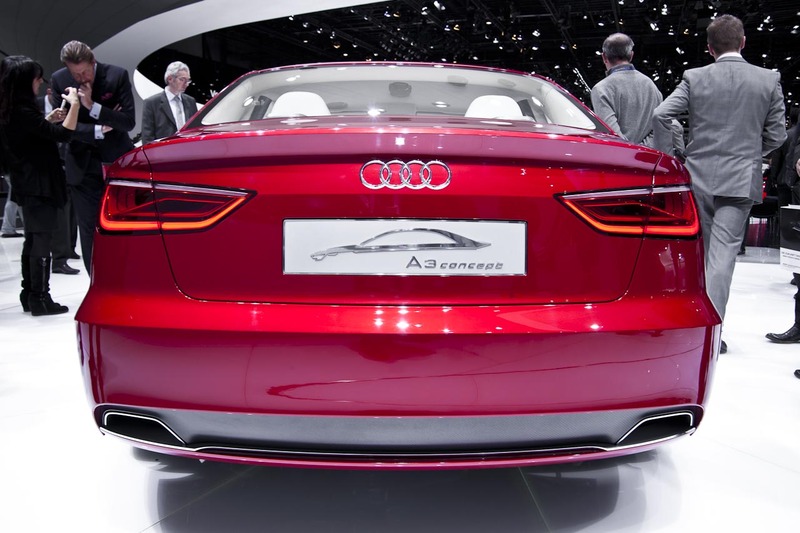 The outside mirrors, made of aluminum and CFRP, are perched on the top shoulder, just like on a sports car. 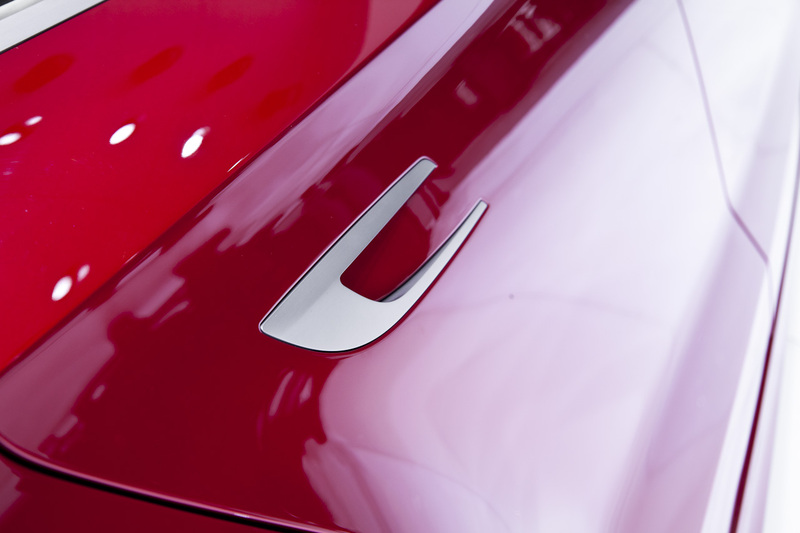 The door handles with their brushed-aluminum clasps are recessed flush with the door. When the driver touches them, they power-extend. 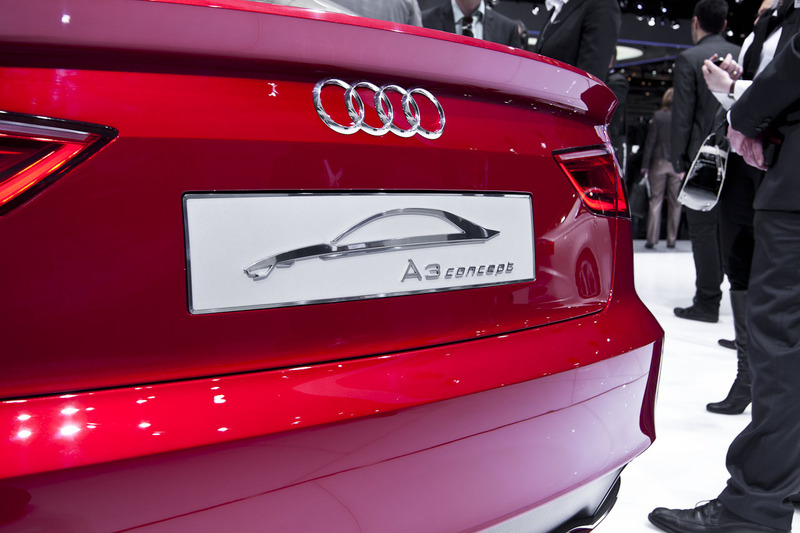 The intelligent interplay between surfaces and lines also defines the tail end of the A3 concept. 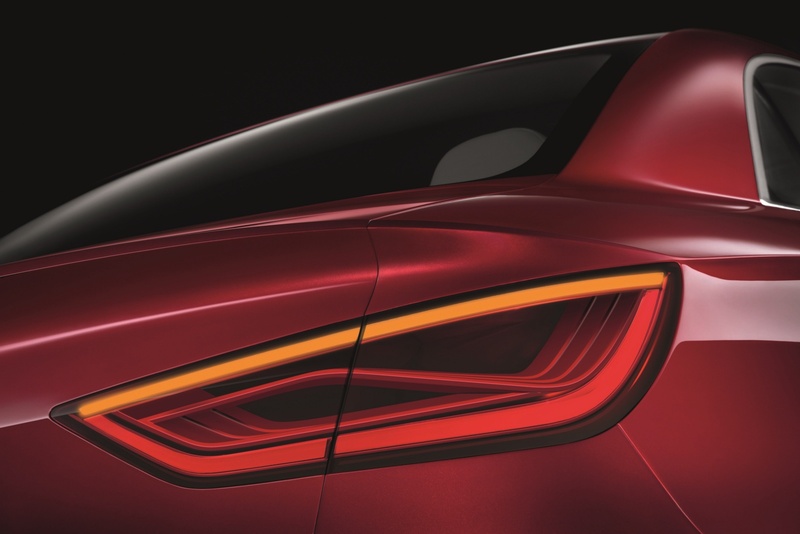 The broad, flat tail lights are sculptured and culminate in a point on the inside, and the tailgate bears an elegant spoiler edge. The rear apron includes a diffuser insert of CFRP and metal, which in turn surrounds the two large tailpipes for the exhaust system. 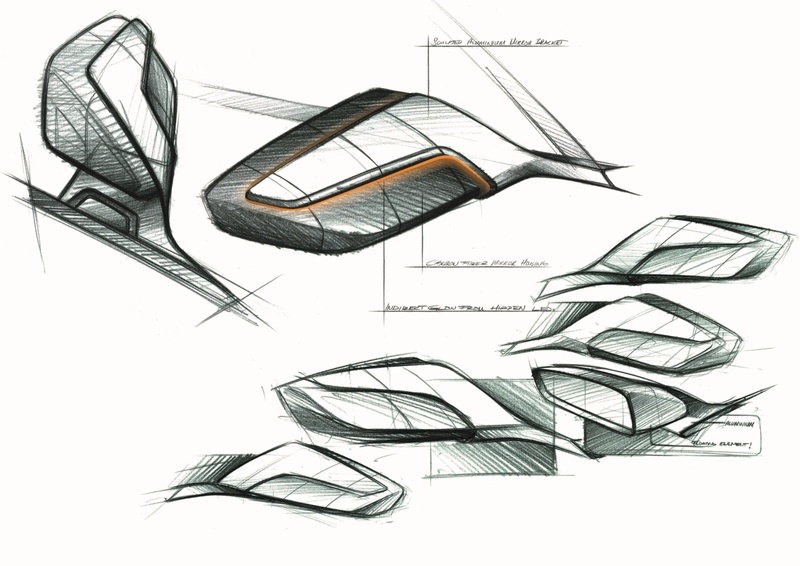 Ultra-modern components, design methods and joining techniques keep the body weight low. One example of this are the custom tailored blanks (panels of various thicknesses) in the floor area. 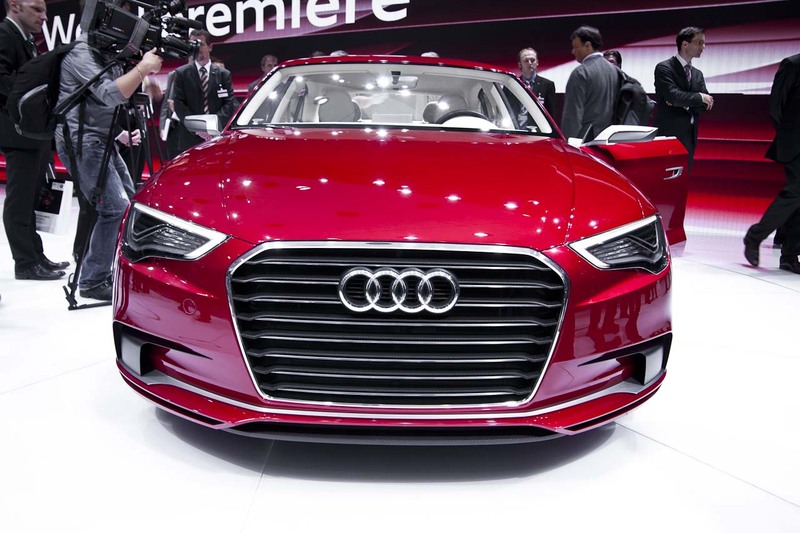 The doors, engine hood and tailgate are made of aluminum. 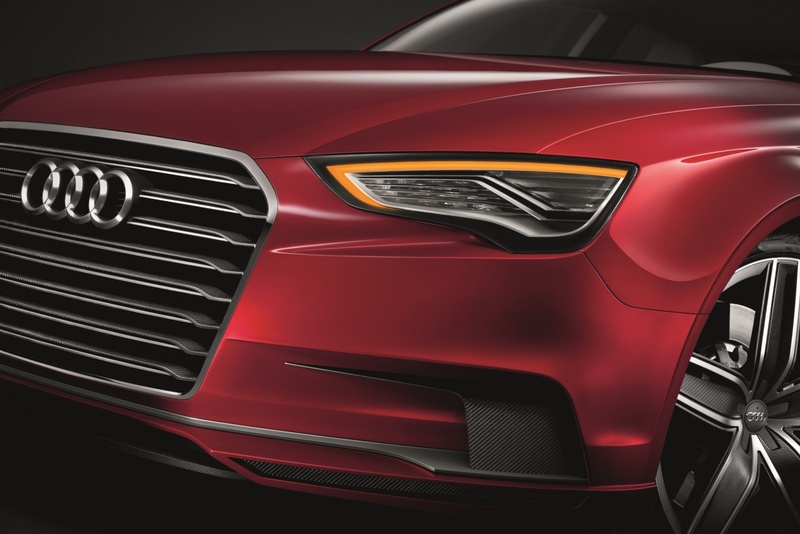 The extra stiff body provides the basis for the sedan’s precise handling, excellent vibrational comfort and low weight – the Audi A3 concept tips the scales at just 1,540 kilograms (3,395.12 lb). Interior The interior of the showcar is generously proportioned. 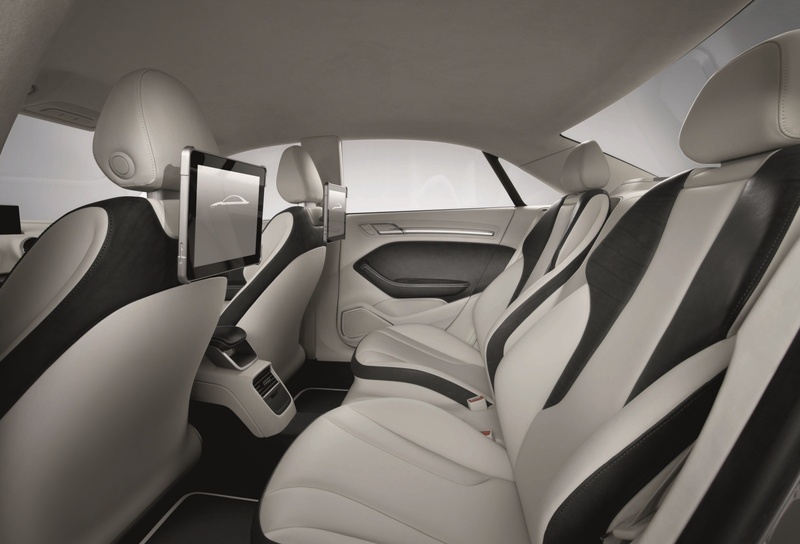 The long wheelbase measuring 2.63 meters (8.63 ft) – a best-in-class figure in the premium compact segment – gives rear passengers on the two individual seats a pleasing amount of knee room. 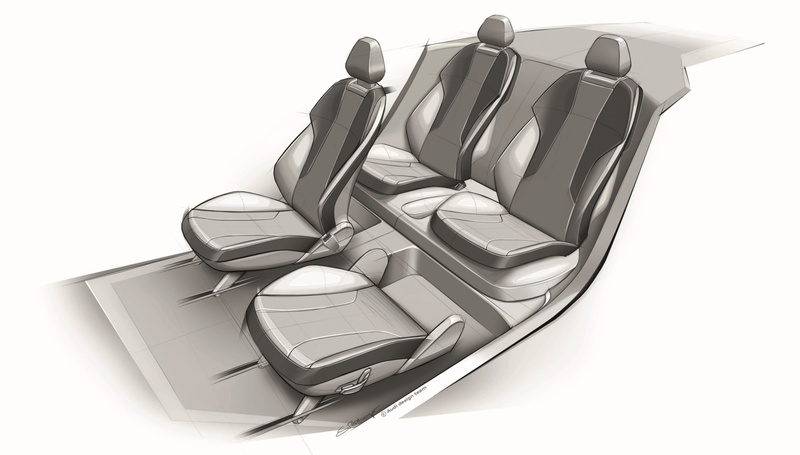 The front sport seats with prominent side bolsters are slim and elegant. 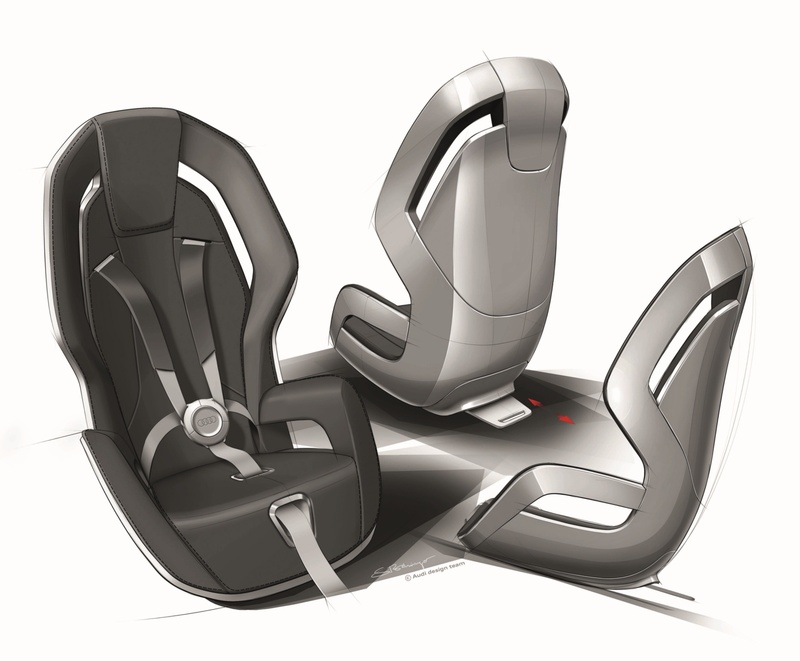 The cockpit also gives an impression of lightness and airiness. The horizontal lines emphasize its design. The instrument panel draws the driver in – typical of Audi. 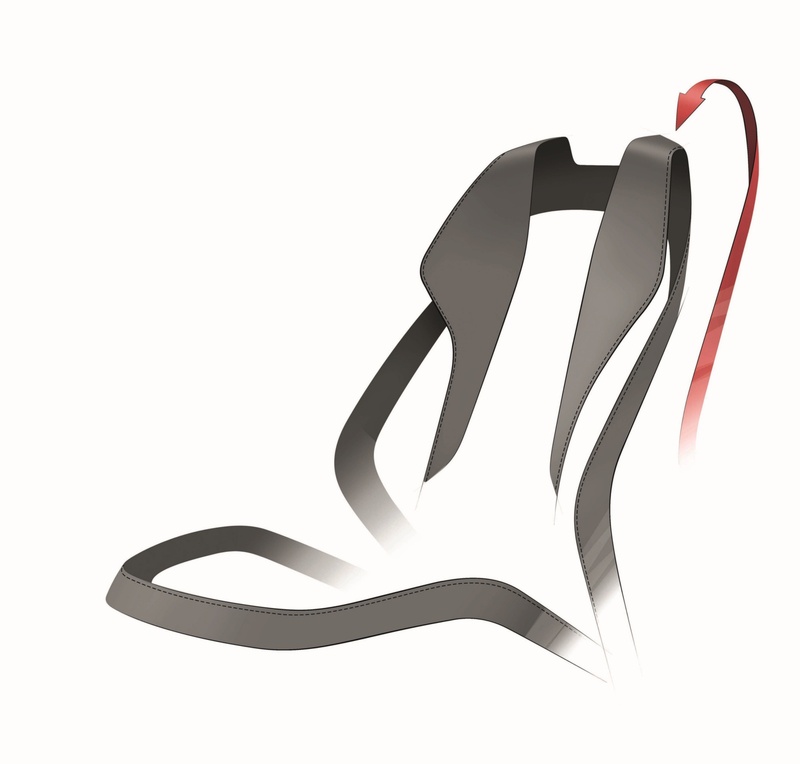 Defined in three dimensions, the large trim strip is made of solid aluminum and includes control functions. 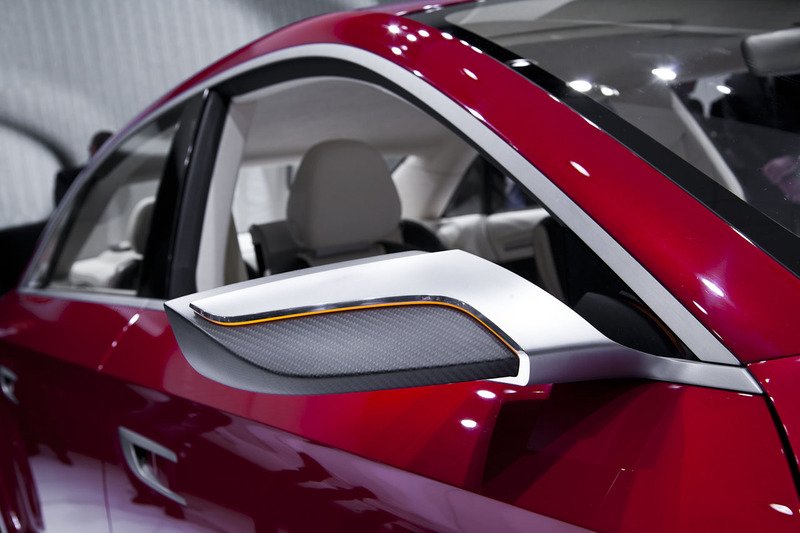 The high-quality sound system in the doors and on the rear shelf has aluminum trim panels. When the audio system is turned on, they extend a few millimeters, thus orchestrating a visual accompaniment to the system’s excellent sound. 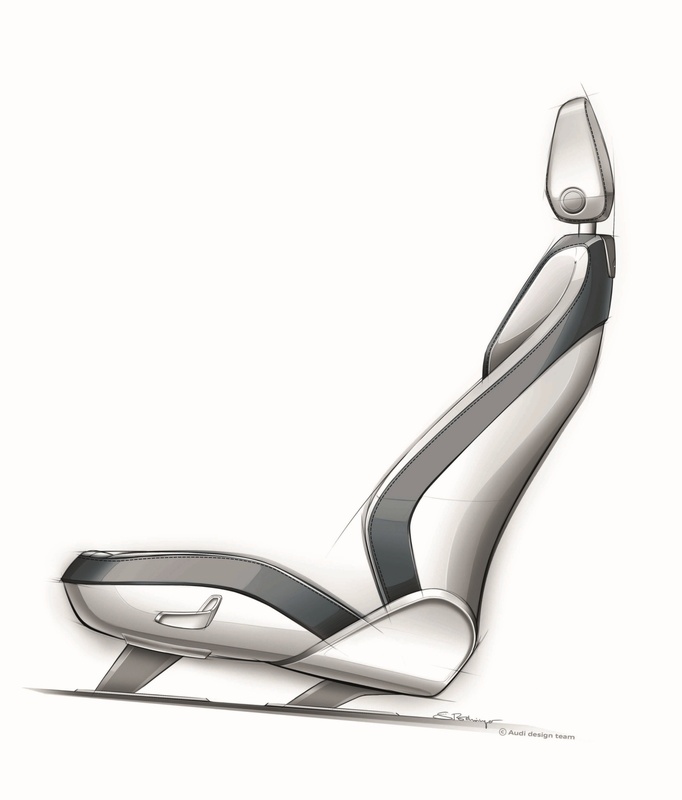 On the center console four large, round air vents echoing a jet’s design catch the eye. 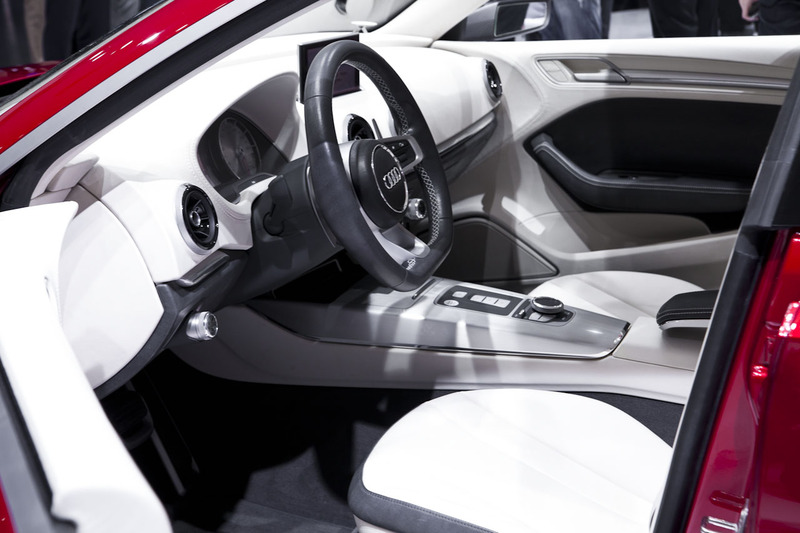 The air flow is adjusted by pulling and pushing on the center axis of the vents. 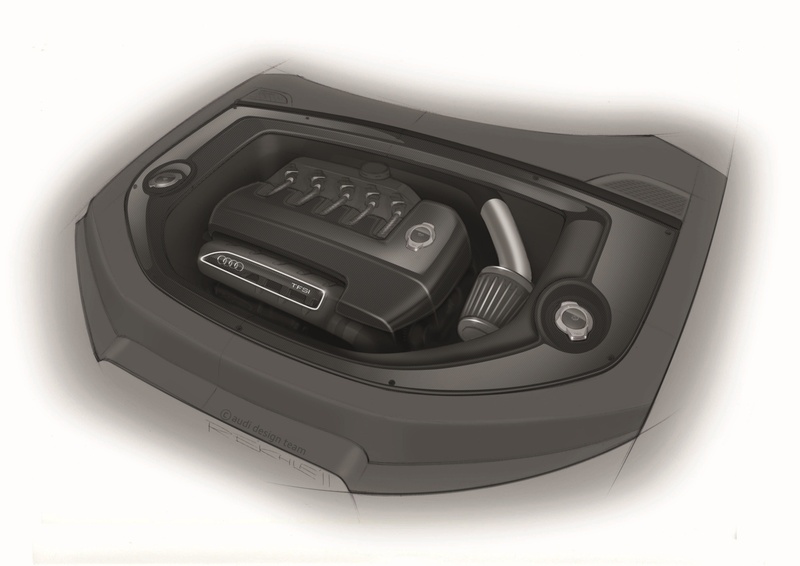 The control knobs for the automatic air conditioning system are located in the lower section of the center console on a boldly protruding dedicated control panel. Visually, they are reminiscent of airplane turbines. Located behind the compact, flat-bottomed, three-spoke multifunction steering wheel are two analog dial instruments with black dials and red needles, complemented by additional kidney-shaped displays. 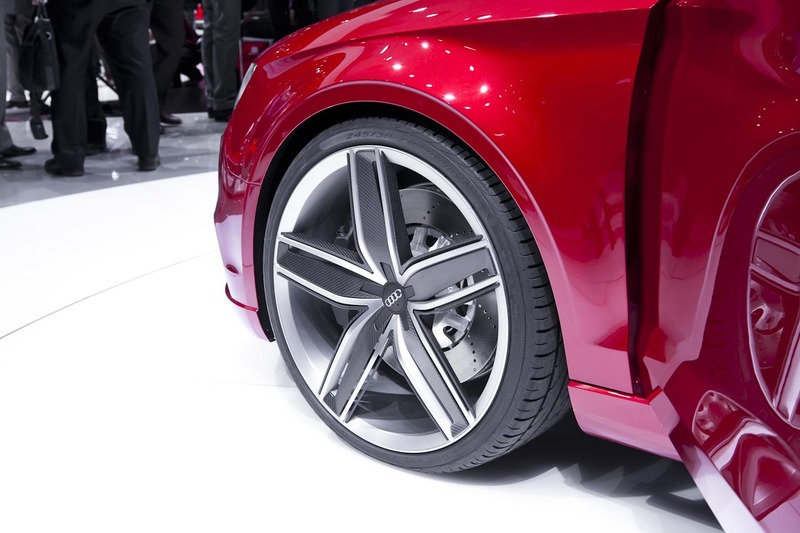 Engraved rims made of brushed aluminum underscore their classy look. In between the two large round dials is the large, eight-inch display for the driver information system. The display is user-programmable – the driver can select the content to be displayed from an extensive menu. The control panel for the MMI multimedia system is located on the center tunnel console. 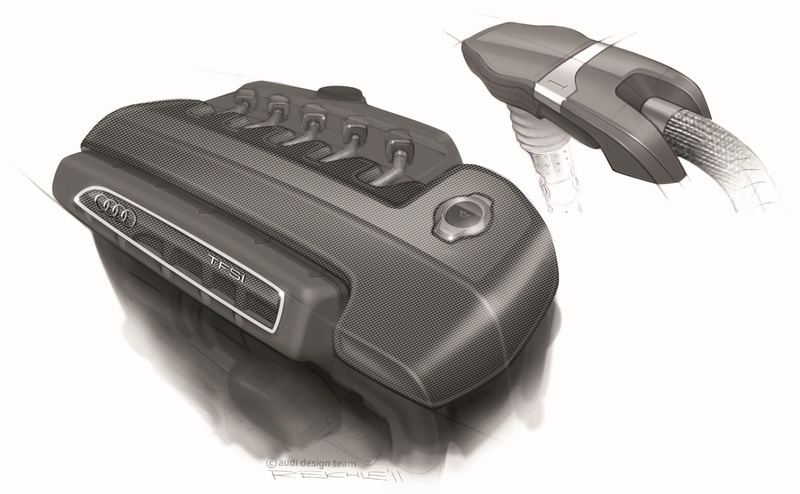 The surface of its large rotary pushbutton includes the touch pad, MMI touch. 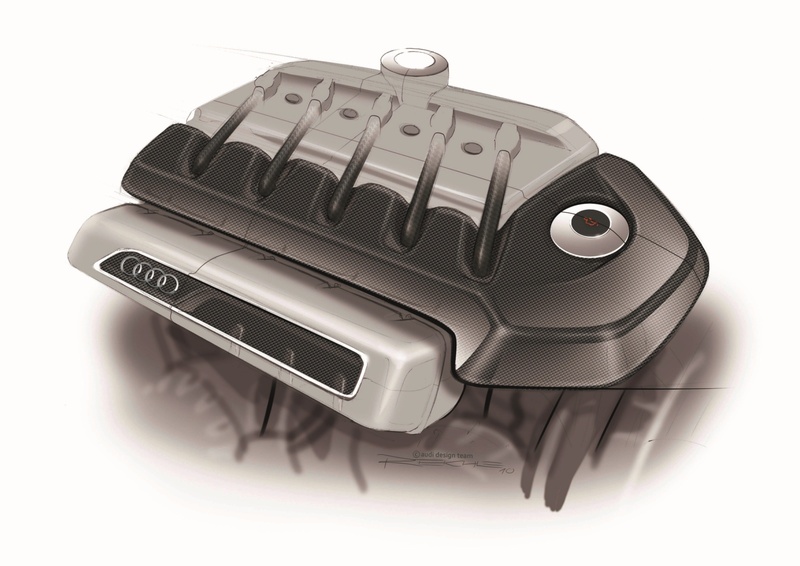 This new solution, which makes the already exemplary operation even more intuitive, will soon be introduced in series production at Audi. 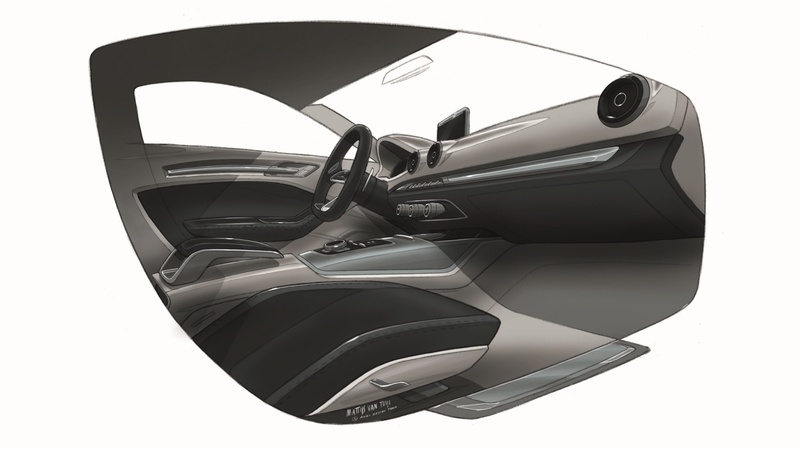 The ultra-thin MMI monitor power-extends out of the instrument panel, another feature taken from the full-size car class. 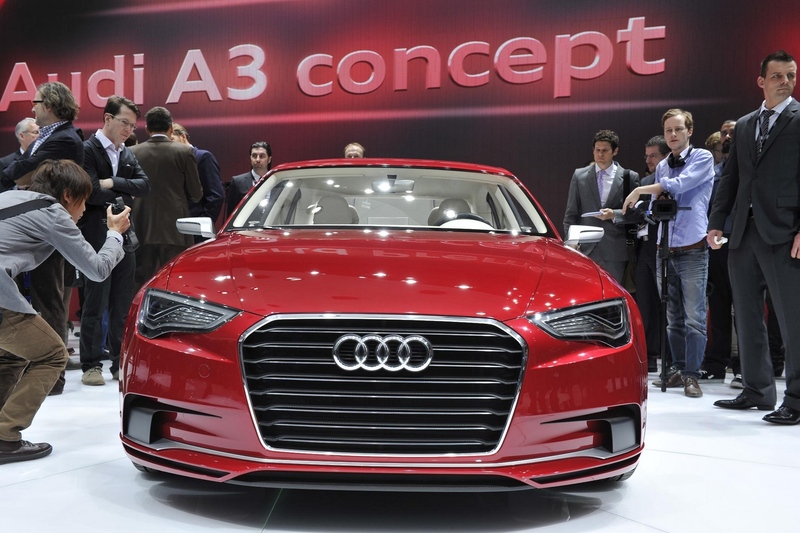 In terms of infotainment, the Audi A3 concept shows why the brand is leading the competition. A UMTS model provides full access to the Internet, allowing the car to retrieve convenient services from Google. Thanks to the WLAN hotspot, passengers can surf and send e-mail to their hearts’ content. Holders for iPads are installed on the back of the front seat backrests. 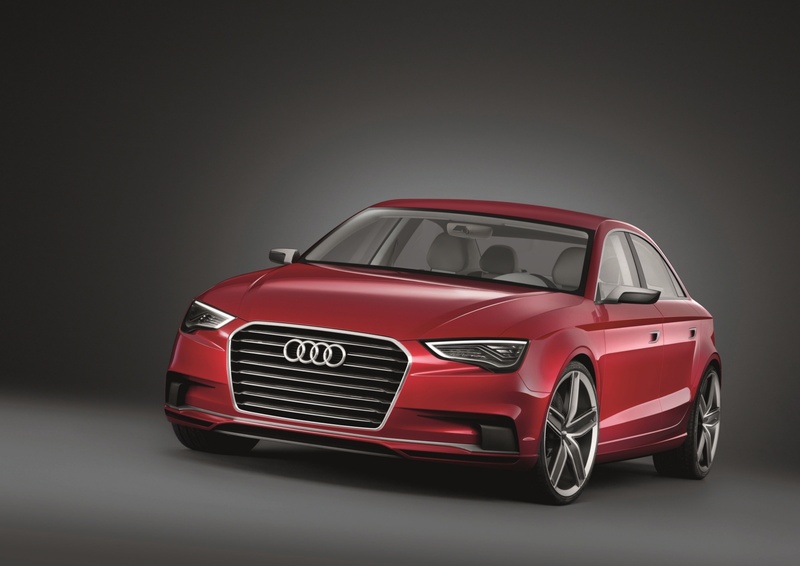 A classic notchback sedan, the Audi A3 concept boasts a large luggage compartment with a volume of 410 liters (14.48 cubic ft) and a low loading lip. 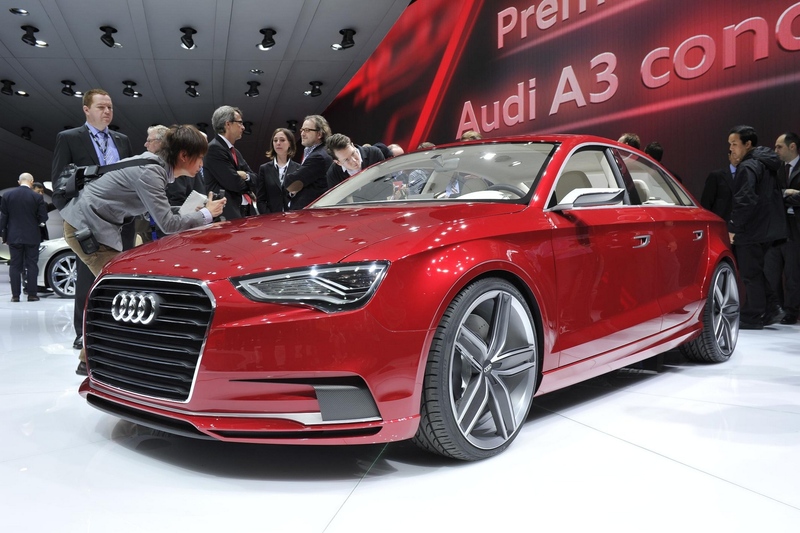 Drivetrain The A3 concept has a five-cylinder engine under the hood that combines the Audi technologies of turbocharging and FSI gasoline direction injection. 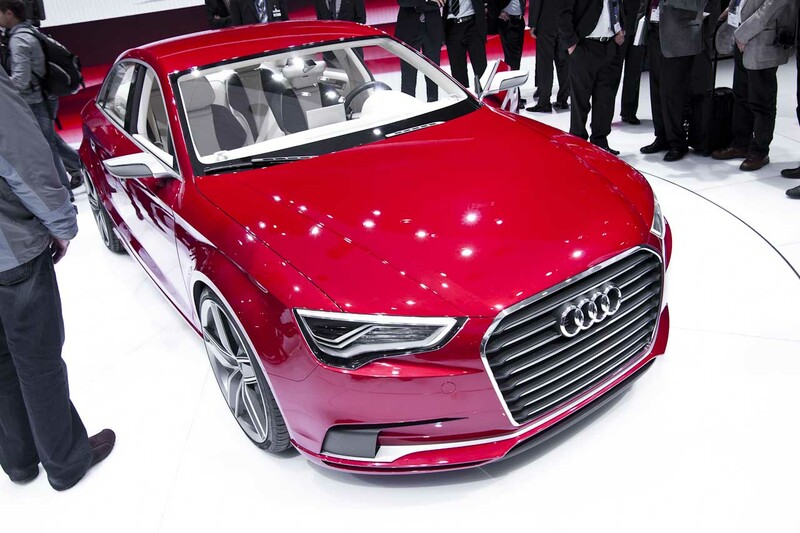 It develops a hefty 300 kW (408 hp) from a displacement of 2.5 liters. 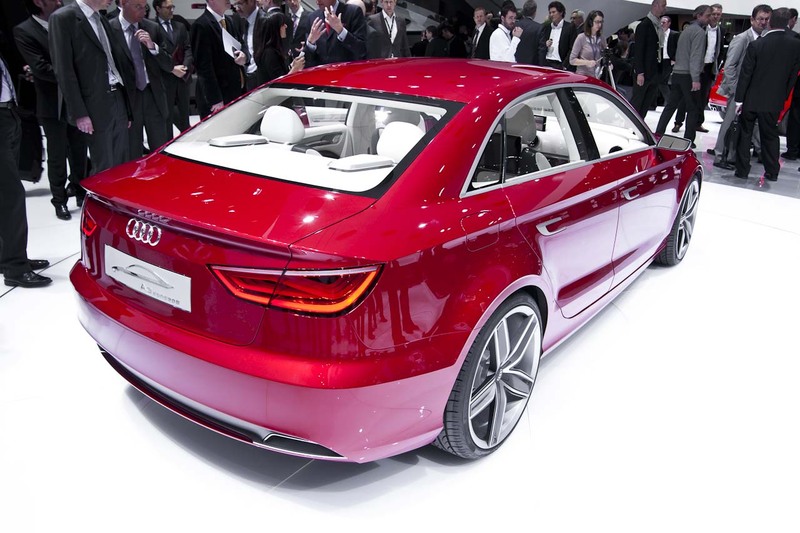 Its peak torque of 500 Nm (368.78 lb-ft) is available over a broad rev range between 1,600 and 5,300 rpm. The five-cylinder powerplant unleashes a rousing soundscape – its typical sound pattern calls to mind the Audi sound of the 1980s and the huge motorsport successes of that period. 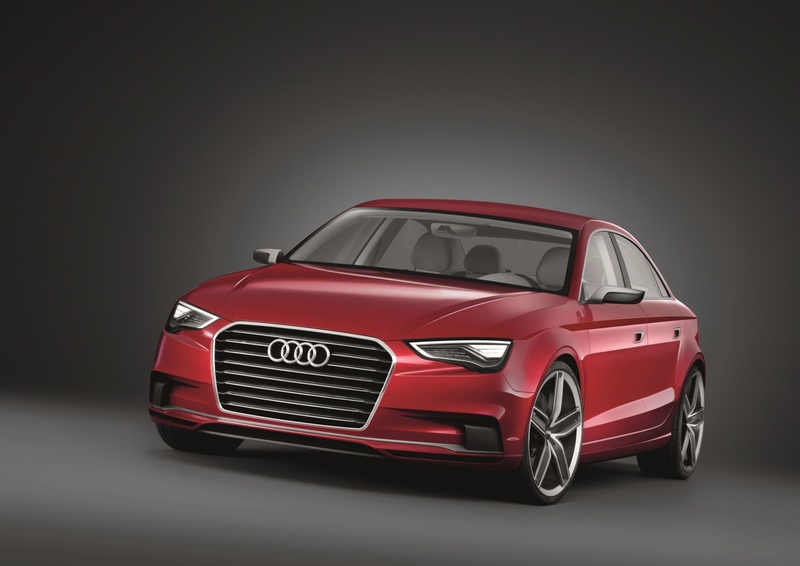 Its performance is a complete homage to tradition: The A3 concept catapults from a dead stop to 100 km/h (62.14 mph) in 4.1 seconds, and its electronically governed top speed of 250 km/h (155.34 mph) is merely the official figure. 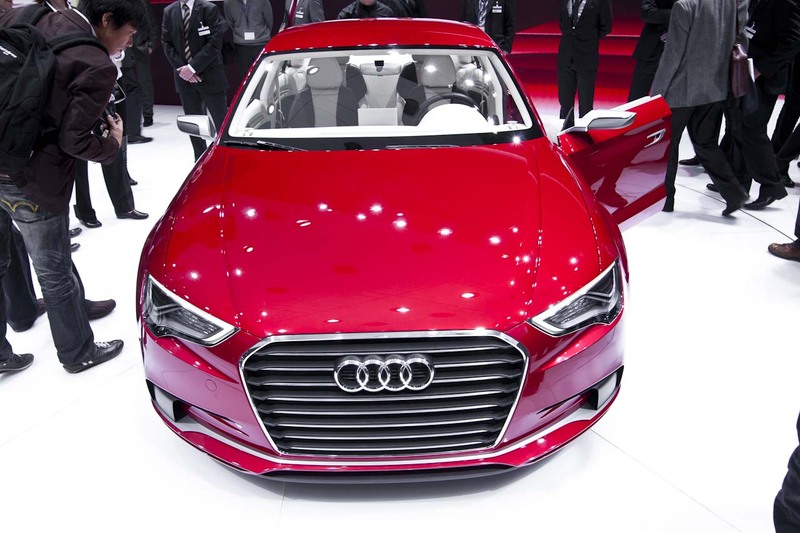 In terms of fuel consumption, the four-seater requires just 9.1 liters of fuel per 100 km (25.85 US mpg) and emits 212 grams CO2 per km (341.18 g/mile). 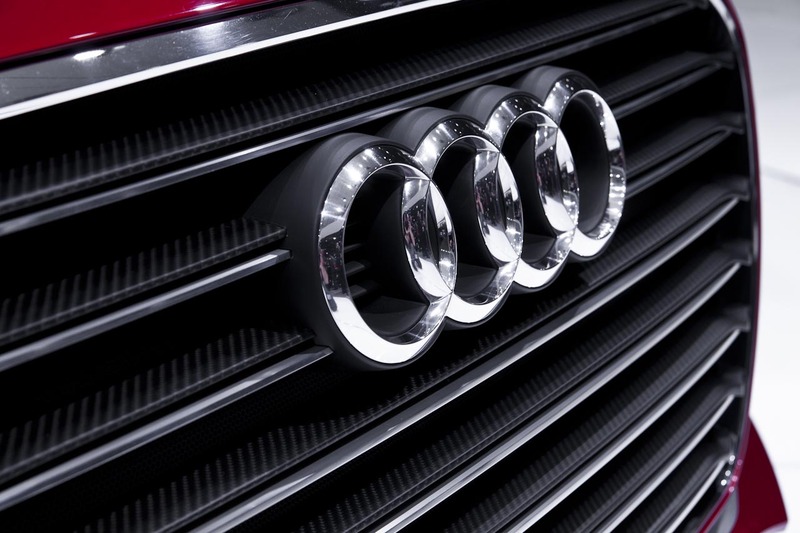 A regulated oil pump, the intelligent Audi thermo-management system and a energy recovery system – technologies from the brand’s modular efficiency platform – all contribute to this high efficiency. 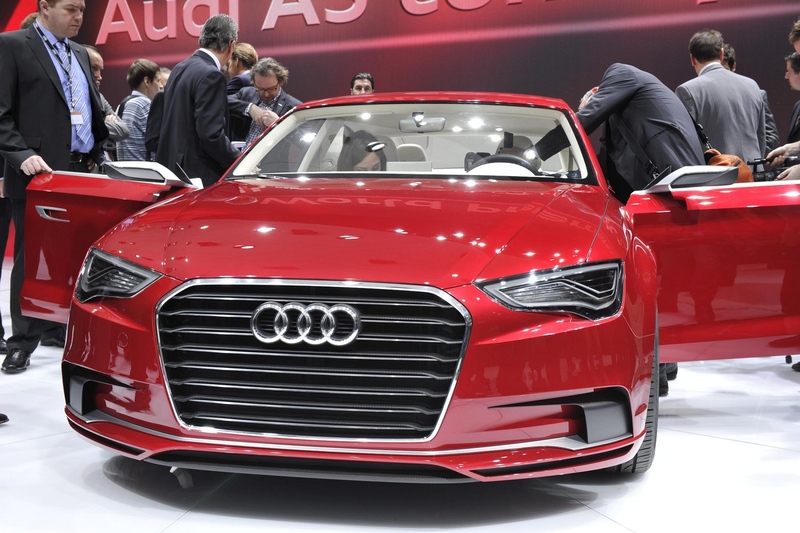 A compact seven-speed S tronic serves as the transmission. It comprises two transmission structures, which are operated by two clutches. Gears are alternately shifted by the two clutches – at lightning speed, comfortably, and without any perceptible interruption of traction. 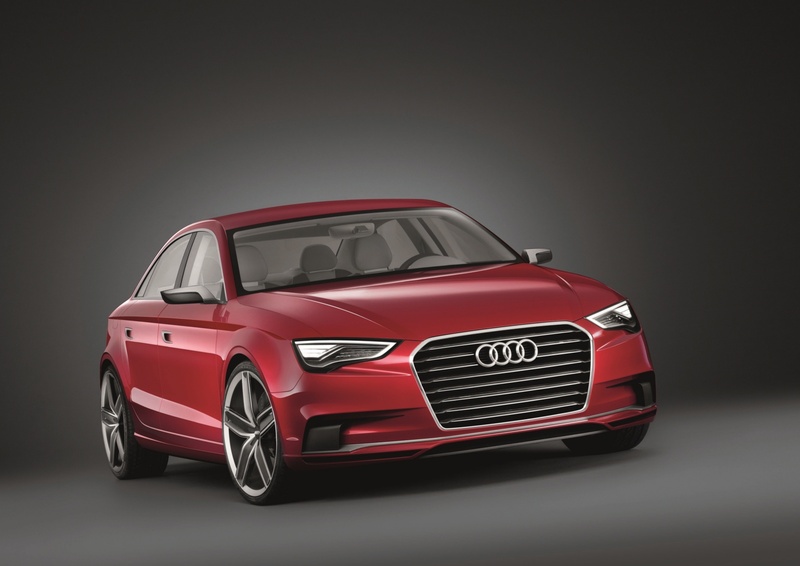 The driver can operate the seven-speed S tronic in one automatic mode and one manual mode, using the paddles on the steering wheel to shift gears manually. Elegant touch control buttons on the center tunnel console are used to select drive positions R, N and D. These are backlit in red when it gets dark. 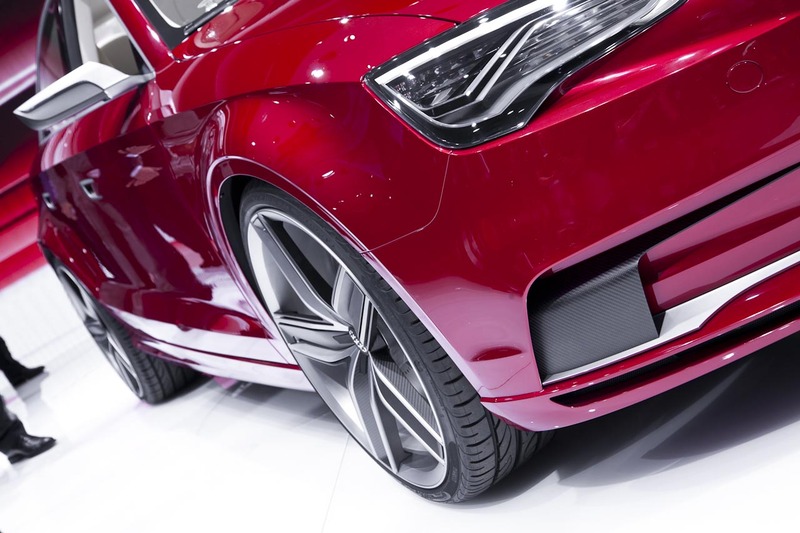 Drive position P is automatically engaged when the electric parking brake is applied. 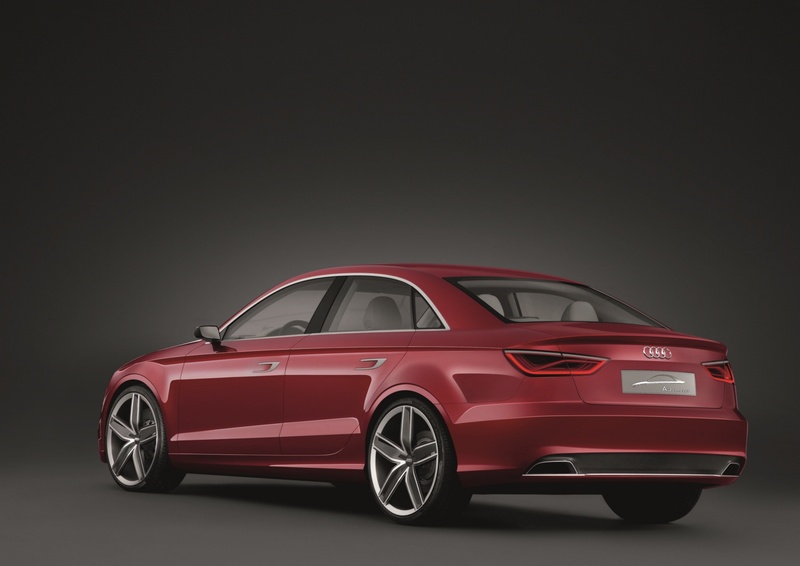 The launch control system manages the sprint from a dead stop, furnishing explosive turbo power with minimal tire slip. 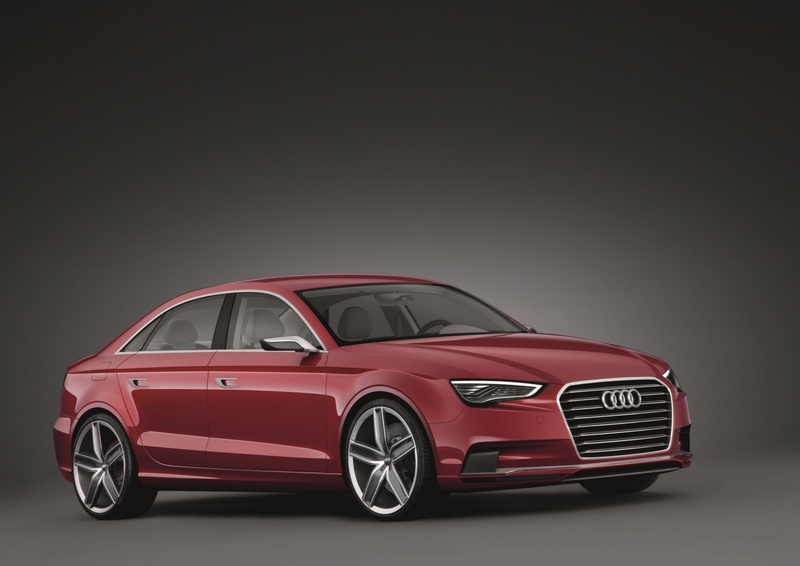 Power is effortlessly transmitted to the road via quattro permanent all-wheel drive. Its centerpiece is an electronically controlled multi-plate clutch at the end of the propeller shaft. When slip occurs at one of the axles, the clutch redirects the majority of the torque input to the wheels with the better grip. 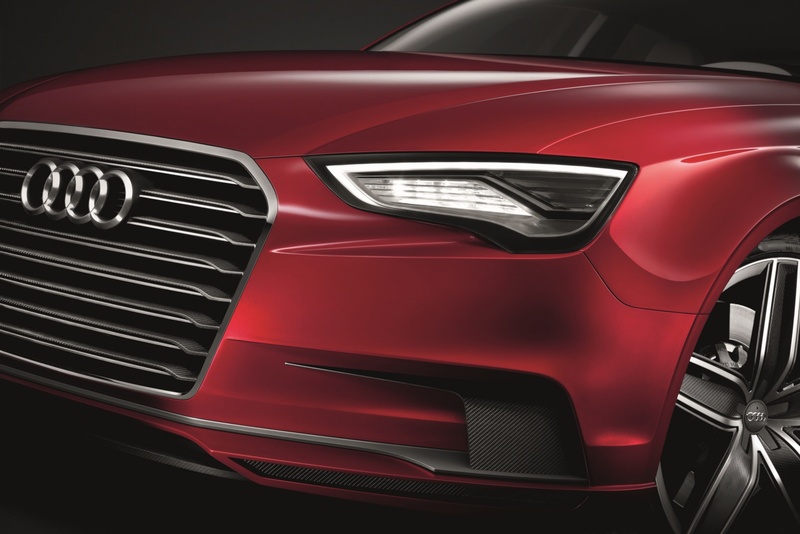 Chassis Derived from the current RS 3 Sportback, the chassis of the Audi A3 concept is fully capable of handling the power from the drive system at all times. The four-seater masters any type of curve with speed, stability and composure, turning spontaneously into corners going in and providing superior traction going out. 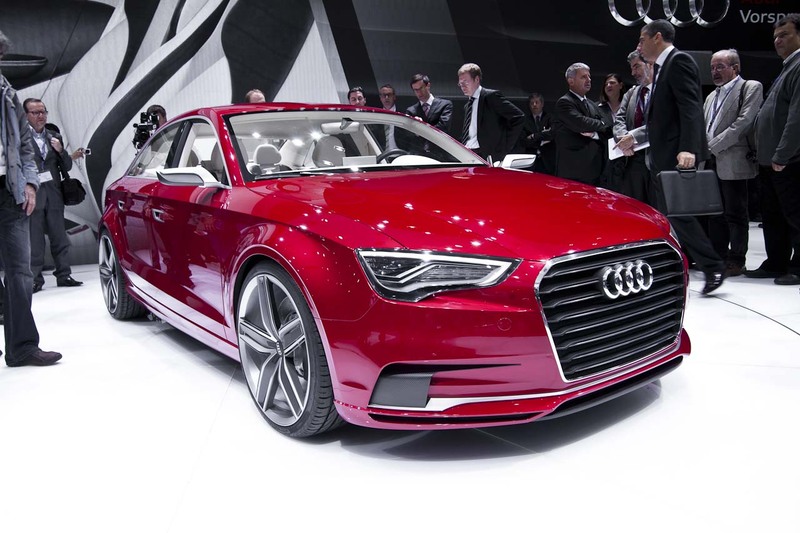 Its self-steering response remains essentially neutral all the way up to the lofty handling limits. The front suspension – a McPherson construction with a separate axle support – has a track measuring a full 1,572 millimeters (61.89 in). 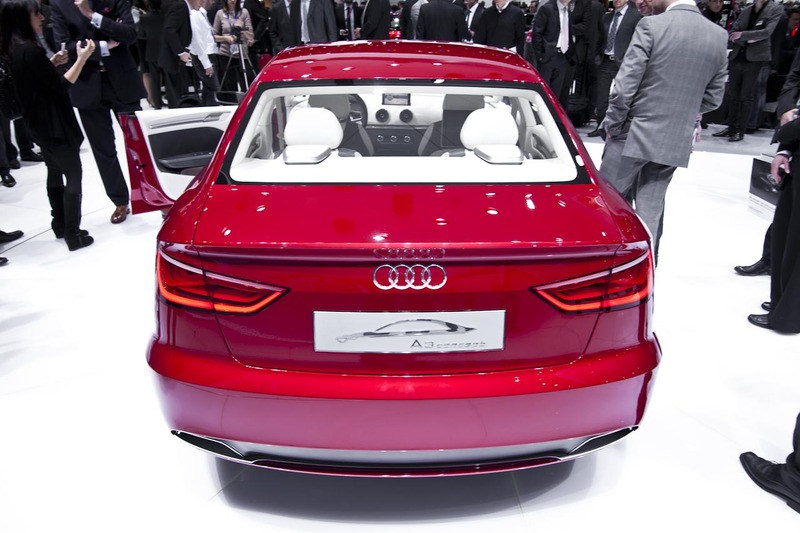 To a large extent, its components are made of aluminum. The rack-and-pinion steering is extremely efficient because its electromechanical drive system requires no energy when driving straight ahead. 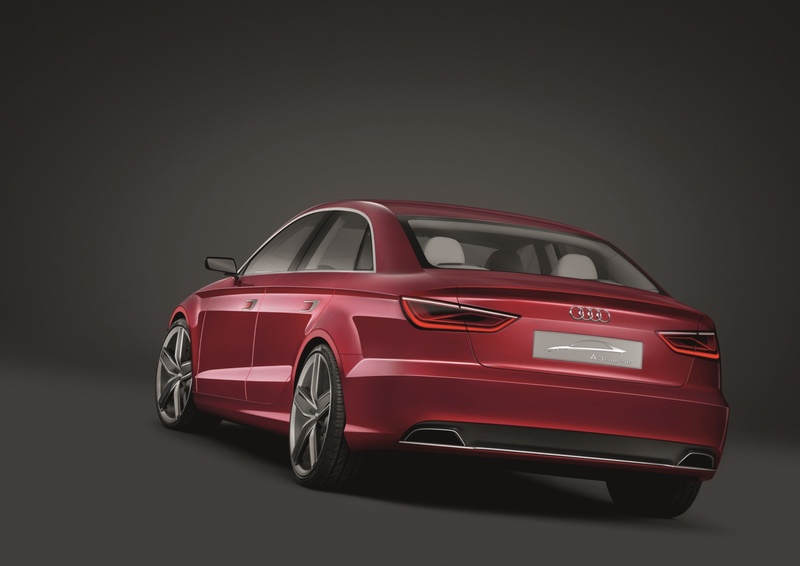 The Audi drive select dynamic handling system gives the driver five modes from which to select the engine characteristics, power steering and the seven-speed S tronic. 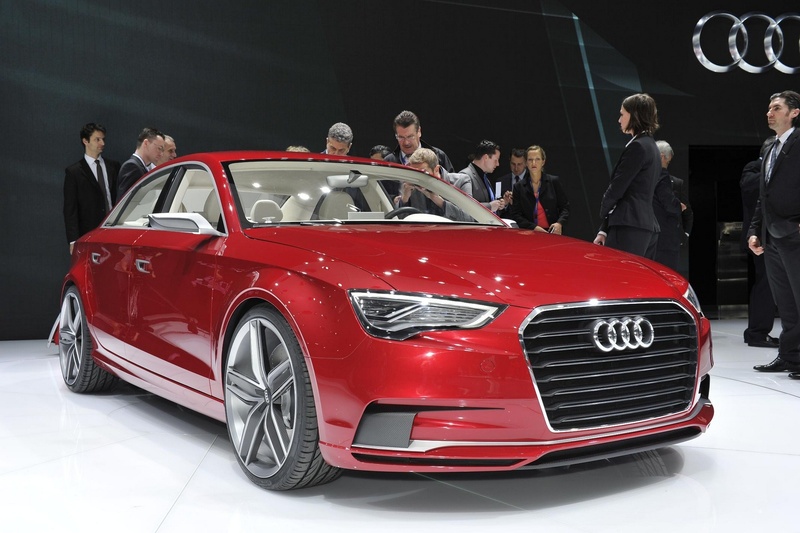 The modes are comfort, auto, dynamic, individual and efficiency, the last of which is designed for maximum economy. 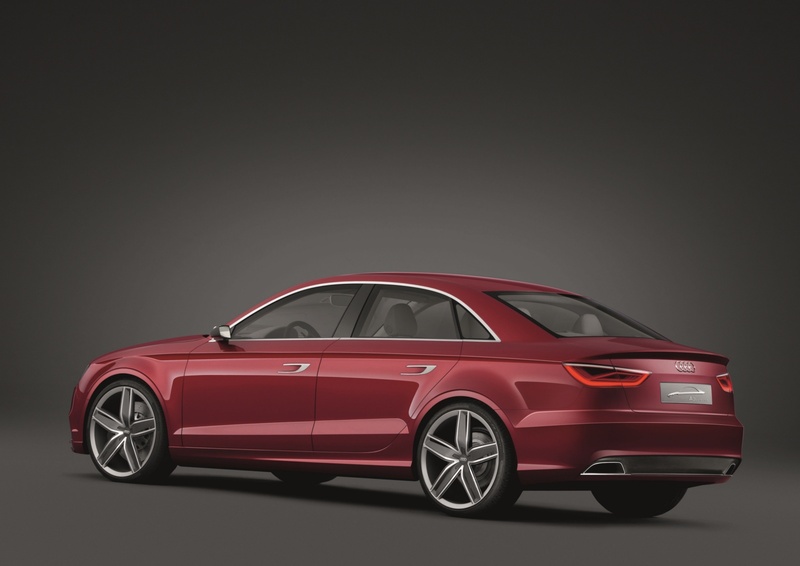 The imposing light-alloy rims measure 20 inches in diameter. 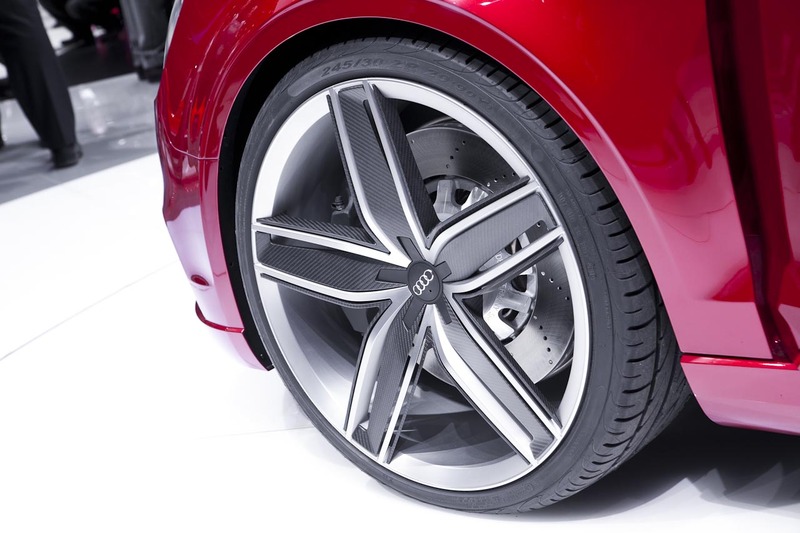 In five twin-spoke design, they are made of CFRP and aluminum. 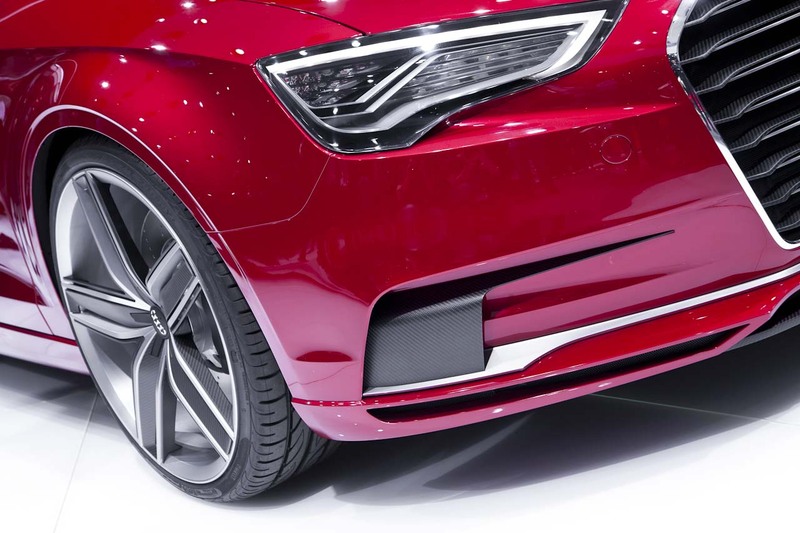 The slender, recessed rims optimize ventilation. The tire format is 245/30 at the front and rear. The front brake disks are gripped by four-piston calipers. The ESP stabilization system has a Sport mode and can be completely deactivated. The parking brake is actuated electromechanically.